Explore St. Charles' Central Historic District and discover the rich history of downtown St. Charles. Enjoy walking and viewing our new self-guided walking tour of 27 historic locations. Each sign is numbered for your convenience, features a historical photograph, and information to keep you following the trail. This newly created innovation is a collaborative effort between the Downtown St. Charles Partnership, St. Charles History Museum, the City of St. Charles, and Historic Preservation Commission. Make sure to scroll down further to learn more about the Central Historic District and about the 27 featured sites. 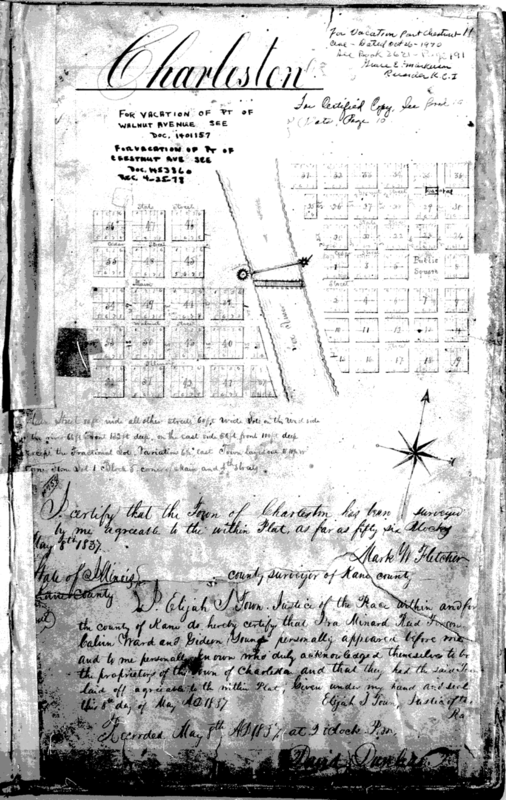 Original Plat of Charleston, c.1835, courtesy of the Kane County Recorder’s Office. What is the Central Historic District? Designated by the City in 1995, the Central Historic District encompasses the downtown area and includes the original town of St. Charles as laid out in the 1830s. The District contains the classic Main Street storefront buildings, as well as St. Charles' most notable architectural icons: the Romantic Revival style 1928 Hotel Baker, the Art Moderne style 1940 Municipal Center and the Spanish Colonial Revival style 1926 Arcada Theater, all of which are also listed on the National Register of Historic Places. Want to learn more about the sites on the Historic Walking Tour? Download the brochure here which list all of the location of each historic sign. Originally constructed by Dr. Thomas Whipple as a residence and medical office in 1841. Shortly after, Dr. Abel Dewolf purchased the residents and added the second floor in addition to the Italianate features in 1856. Dr. DeWolf took over Dr. Whipple's medical practice and for the next 40 years could be seen traveling throughout Kane and DuPage counties via horseback or buggy. This was the home of H.T. Rockwell, local postmaster, alderman and two -term mayor of St. Charles (1885-89). In 1950, Yurs Funeral Home purchased the property. In 1985, what is now the parking lot for Yurs Funeral Home is where Col. Edward Baker's house once stood but was moved to State Avenue. Illinois Cleaners was founded in 1911 by George Neumark, who also served as St. Charles’ mayor (1961-1969 mayor). This business flourished until the 1960s, when the “polyester years” negatively impacted the dry cleaning began and dry cleaning became a less lucrative industry. Eventually, William Marberry and his four sons bought not only Illinois Cleaners and but also several other Chicagoland dry cleaning businesses. Charles McCornack founded the McCornack Oil Company in 1904. He started the business with ten oil tanks, three wagons, four horses and several sleighs. The company delivered kerosene to homes and businesses all around the Fox Valley area. In 1911, McCornack began supplying gasoline and the Excelene brand motor oil to meet the demands of the automobile era. As business grew, McCornack opened a gas station at 300 West Main Street in 1920, and then opened this gas station on East Main Street in 1928. The McCornack Oil Co. Gas Station located at 215 E. Main Street was the premiere gas station at the time of its construction in 1927. Most stations were small buildings fitted with a restroom and minimal inventory for the attendant and no indoor service bays for vehicles. The McCornack Oil Co. Gas Station was constructed with an overhead canopy, two heated indoor service bays, separate restroom facilities, as well as a corporate office overseeing five service stations and bulk plant deliveries. The building was adapted for use by as the St. Charles History Museum in 2001. Minard Hall was the city’s first opera house. It featured local entertainment talent, concerts, and political speeches. William and Alonzo Barry also had a law office in the building, and it Is believed that Abraham Lincoln visited the Barrys here. This building also functioned as the first St. Charles Public Library from the 1880s until 1906. On their many trips to California and Florida with his wife, Dellora Angell Norris and Lester J. Norris were inspired by the Spanish style as the design for his new theatre back home in St. Charles. Designed by Elmer Behrns, the three story theater stands richly­ appointed and the Arcada's grandeur made it "the finest 1,000-seat theatre in the Midwest." Most of the exterior elements of the building remain however, the original marquee was replaced with the current vertical sign and was attached in 1943. In 1997, Craig Frank, a local businessman, completely restored the Arcada and the Hotel Baker and was celebrated as "Mr. Landmark St. Charles" in 1997. Club Arcada, which originally opened on December 29, 1934, was originally located on the first floor of the Arcada Theatre. Later, the space was occupied by the Scotland Yard Bar, and today by the House Pub. In 2017, Club Arcada reopened as a speakeasy, but is located on the third floor, and is a 1920s-style nightclub, which encourages guests to wear costumes. After a fire destroyed the entire block in 1895, Frank Osgood, Bela T. Hunt, and Levi Morse began to rebuild the entire block. This location was once the station for the Chicago Aurora and Elgin Railroad, which operated interurban cars that ran on Main Street. In 1915, a Chicago Great Western Railway train jumped the tracks and struck the 12 E. Main Street building. Many businesses and professional offices have occupied the Osgood, Hunt, and Morse Block since 1896, everything from a meat market, tailor shop, and tea shop. Today, BMO Harris Bank owns most of the buildings in this block. The first bridge spanning across the Fox River was built in 1836. Spring thaws and fast flowing ice blocks destroyed the early bridges several times during the 19th century. Through the years, seven bridge spans have been erected at this site, the latest in 1997. In 1927, the bridge was rebuilt and to be widened to coincide with the opening of Hotel Baker. Route 64 came through St. Charles in the same year which Col. Baker worked to have routed through the city. Lester J. Norris helped to design the 1927 bridge, which was adorned with four bronze foxes, that were purchased by Herbert P. Crane. The foxes are symbolic of the Fox River over which they stand guard. Later these four foxes inspired the story of the "Four Sons of Charlemagne," a story written by St. Charles Mayor C.V. Amenoff (1969-1973). Built around 1850 by photographer, cabinet maker, and printer Dewitt Clinton Pratt. The Butler-Pratt building is one of the oldest buildings in St. Charles. Pratt first used the structure first as the headquarters of his daguerreotype photography business, then as a gallery when his operations after he moved his operations moved to Aurora. Oliver Morris Butler, a paper manufacturer, then bought the building later in the 19th century. After Butler’s death in 1888 the building became Marsden Brothers Hardware. During its early years, this classical style building housed a shoemaker, a clothing store, and a jewelry shop. 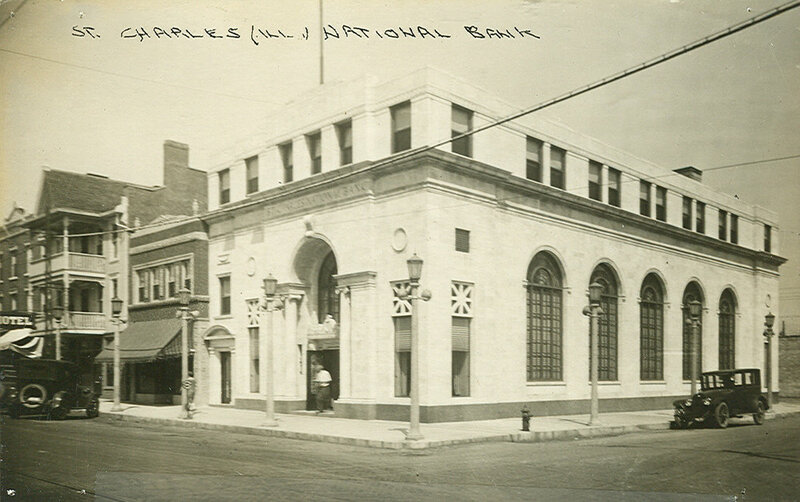 The St. Charles National Bank was located here from 1902 until 1926, when it moved to 200 West Main Street. In 1926, Col. Baker donated the Tudor Style Community Center to the City of St. Charles in memory of his son Henry Rockwell Baker (1891-1914). Col. Baker wanted to provide a central meeting place and recreational facility for St. Charles residents. The Community Center over the years has housed a lounge, meeting rooms, bowling alley, and a 20' x 60' swimming pool. The bowling alley was later removed to create a space for a youth center called “The Keg,” which flourished in the 1960s. Today the Baker Community Center is one of the most widely recognized buildings in town and is home to St. Charles Park District offices. In 2017, the Community Center in partnership with the Park District, updated and renovated the building to make every floor of the accessible. This structure was built by Joseph Gartner in 1905 to house his bakery and confectionary. Gartner was, in fact, an immigrant from Germany who arrived in Illinois at nineteen years old and first worked in a Hampshire. In 1890, he and set up shop in the Dearborn building at Main and 2nd Street before moving to the new location 15 years later. Gartner’s bakery became famous for its five-cent ice cream dishes and 25-cent Sunday dinners. Joseph’s son, Karl, ran the business until 1960, when the building was sold to Bagge Pharmacy. LeRoy Rehm, originally of Afton, Iowa and having grown up in Chicago’s Lincoln Park, moved to St. Charles in 1914. After working for several years as a teacher of electrical work at Mooseheart, he opened his own electric company in his adopted hometown. In addition to selling electrical appliances and providing the St. Charles area with electricians, Rehm Electric built the connections which originally lit up Buckingham Fountain in Chicago back in 1927. Louis Klink moved to St. Charles from Wurtemburg, Germany in 1854. He built the Wagon Shop in 1866 and included a ramp so that finished wagons could be rolled to the street. The building also housed a blacksmith shop in its first floor. 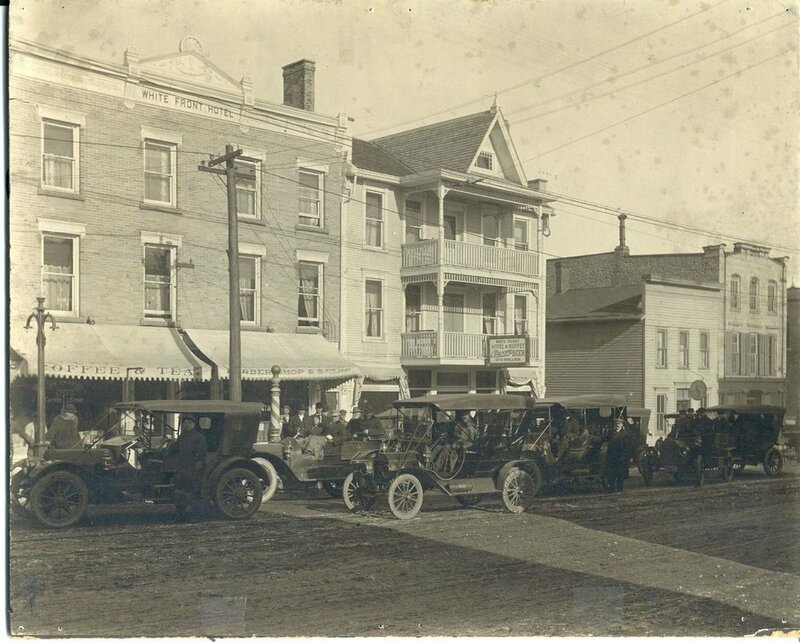 After approximately 50 years in operation, Klink’s Wagon Shop was demolished to make room for the Italian Renaissance building which now takes its place. This newer construction has been home to many general and dry goods stores, as well as the Blue Goose and an antiques market. This Gothic Revival style structure is the first Roman Catholic church in St . Charles. The building was used as a church until 1912, and then was used as St. Patrick School classrooms until 1950. The building, remained vacant until 1974, when it was redeveloped into the Old Church Inn restaurant. The building was expanded to the north in 1996, and the steeple was removed in 2009. Dr. Edith Bell Lowery Lambert and Dr. Richard Lambert built the first St. Charles hospital. In 1924, it was converted into the Moose Hall when the city hospital relocated to the Gillette House on N. 2nd Ave. In 1940, the hospital moved into the Delnor Hospital building on N. 5th Ave., which was built by Lester and Dellora Norris and bears her name. Charles Samuel McCornack was born in Elgin on January 5, 1873. He moved to St. Charles in 1903, and purchased the St. Charles Oil Distribution Company from Henry Delno in 1904. For the first years of business, the McCornack Oil’s business address was his house. Shortly after, Charles bought the first truck for his business, which made his work easier, more efficient, and more profitable. By 1920, rolled around, Charles McCornack had such a booming business that he was able to open his first of four service stations, the first located here on the northwest corner of West Main and Third Street. He later opened another gas station at 215 E. Main in 1928, where the St. Charles History Museum is now located. The site operated as a gas station until 1977. The station was renovated and the Filling Station Restaurant now resides here. St. Charles experienced an economic boom in the mid-1800s. As a result, the White Front Hotel was built to accommodate the increase in tourism. Originally built by John Billings in 1851, it was sold soon after to the Aurora Brewing Company. The building was bought and sold again many times in the following decades, but in 1928, the Kacheres family opened the St. Charles Hotel and Café. Since then, the building has mainly contained restaurants and apartments and now houses the Main Street Pub. At the same time the Baker Community Center was being built and the Hotel Baker was being designed, Col. Edward J. Baker announced the construction of a new St. Charles National Bank building. Designed by Wolf, Sexton, Harper & Truax, the same architects who designed the Hotel Baker and the Baker Community Center, Col. Baker instructed the architects to build the most modern and elaborately furnished bank of its size in the country. The building was even completed with machine-gun emplacements for added protection. As a toddler, John Fabian Colson immigrated with his family to St. Charles from Sweden. Growing up in St. Charles, he began as a clerk at Anderson’s Dry Goods store. Upon the proprietor’s death in 1880, he took over the business. As sole owner, he changed the name to Colson’s Department Store. In the early 1900s, the store moved from 24 W. Main Street. to 116 W. Main Street. In addition to being a department store, on the second floor of the building housed the St. Charles Historical artifacts collection, which was the beginning collection of the St. Charles Historical Society. A fire destroyed most of these artifacts in 1933, and in 1954 a flood caused even more damage to the building. Despite these tragedies (compounded by a 1975 fire), the department store remained open until 1992. In 1918, Col. Baker and his niece Dellora Angell Norris inherited the fortune of the founder of Texaco Oil, Col. Baker’s brother-in-law John Gates. Both Col. Baker and his niece Dellora invested the money in St. Charles. Col. Baker began construction on Hotel Baker in 1926. The estimated cost to build hotel was $600,000 and two years later, the final price tag was $1,250,000. The hotel opened to 301 guest on June 2, 1928. The Hotel Baker eclipsed any building project the city had ever seen. Its rainbow-colored ballroom floor is the world's first lighted dance floor. The Hotel generated its own electricity with two hydro-electric generators. Live music that once played in the Rainbow Room Restaurant was connected to loudspeakers in the Municipal Building, making it a "singing tower" that played music across the downtown. The Hotel Baker was Col. Baker's home, and was known across the world because of Greyhound, Baker's record-setting racehorse, the World's Champion Trotter. Once the site of a mill and the St. Charles Fixture Mfg. Co., Lester and Dellora Norris purchased the land after the light fixture manufacturing plant was destroyed by fire in 1928. They donated the land and, with assistance from Col. Edward J. Baker, commissioned this current municipal center. The building was designed in the Art Moderne style by architects R. Harold Zook and D. Coder Taylor, FAIA. The old City Hall (on the eastern side of the current building) was built in the Romanesque Style in 1892 and served as the center of municipal activity until the current Municipal Building was finished in 1940. The two buildings were eventually joined together by a new entry atrium in 1995. This building, constructed in 1836 by Ira Minard, served as site of Minard's company store until the 1840s. In 1842, this building became the location of the first medical school in Illinois. George W. Richards, an established doctor, founded the school that existed for only a brief seven-year period. During its years in operation the school offered courses in anatomy, pharmacy, surgery, and obstetrics. Classes ranging in size from 15 to 20 students trained under well-known doctors who were considered experts in their respective fields. However, the college closed in 1849, after a riot occurred in which one of the college’s students was found to have dug up the grave of a Sycamore woman for medical research. After closing, the site was used by a variety of stores and was remodeled to its present-day appearance. This Greek revival style house was built by Orrin Webster who operated a livery stable here in the 1850’s. Clinton Wing purchased the home near the end of the Civil War. Wing would become the second Mayor of St. Charles from (1877-1879). Wing was a real estate investor and president of the St. Charles Hotel and Park Company property, which would later become Pottawatomie Park. In the 1960s, the home was bought and converted into small shops and in 1974, Marilou Kelly established Town House Books. Al Berg held stained glass classes in the remodeled garage and then established Al's Ice Creamery in the space in 1980. David Hunt purchased Town House Books in 1992 and established the Town House Cafe in the space vacated by Al's Ice Creamery in 1996. Both are part of the Century Corners Shopping District in one of the oldest neighborhoods in St. Charles. Pickle Packers International (PPI) was founded in 1892, to promote and educate consumers about the benefits of pickles. This non-profit agency relocated to the St. Charles area in the early 1960's thanks, in part, to William Moore who resided in St. Charles and had his Pickle Packers International office at 108 ½ East Main Street. PPI gained national attention in the 1990's when the organization appeared as an answer to a question on the television game show Jeopardy: Answer – This Midwestern town is the Pickle Capital of the World. Question – What is St. Charles, Illinois? PPI called St. Charles home until 2004, when the agency was handed over to an international marketing firm now based in Washington D.C. Starting in 1896, the first interurban trolley operating under the Elgin, Aurora, and Southern Traction Company rolled down Main Street. Trains connecting Chicago and St. Charles eventually arrived in 1910. At the 3rd and State streets intersection in Geneva, the Chicago, Aurora and Elgin Railroad (also known as the Great Third Rail) branched off and operated on the Fox River Line. This provided an essential link between Aurora, Geneva, St. Charles and Elgin. The trolleys traveling north entered St. Charles via 3rd Street, running up and down Main Street several times a day. The trolley and railroad lines gave people mobility and provided quicker access to neighboring towns. On October 31, 1937, the line ended operations. Baker Memorial United Methodist Church 307 Cedar Ave.
St. Charles benefactor Col. Edward J. Baker had constructed five buildings in St. Charles when he undertook the construction of a church in memory of his parents, Edward and Martha Baker. Edward and Martha Baker were founding members of the First Methodist Church congregation in St. Charles in 1836. In 1952, Edward Baker hired the architectural firm of Gray, Laz, and Mall of Geneva to design a grand new church for the First Methodist Church congregation. Constructed of Wisconsin Lannon stone with cut stone detailing, it serves as an example of modified Gothic architecture. The cost for design and construction of the church was $1,250,000. The Baker Memorial Methodist Church was dedicated on September 19, 1954, and the Methodist congregation celebrated the move to their magnificent new church building with a ceremonial walk from the old church.